We’ve been working on this case the better part of 11 years. During that time, we’ve heard from countless psychics claiming they know what happened to Jodi by revealing her fate and attacker(s). Our team has debated psychics’ credibility since the first week we investigated this case. We all seem to take different positions. My personal belief is that about 3-5% of psychics out there have a true talent and power to see something most of us can not. Now, I can’t explain it. So that’s probably why I believe. Many of those who make up the other 95% are looking to push a book, an event or simply think they have the abilities to see the past in the present. This assessment isn’t to belittle or disrespect any self-proclaimed psychic who visits this website, because I know there are a lot of you out there. I appreciate the energy and work that most of you put into this case. You’re a big part of keeping this case active. I’m just much more careful about who I believe. When it comes to psychics and their ‘leads’, we’ve wasted far too much valuable time chasing red herrings. I didn’t know who psychic Gary Spivey was until today, but I appreciated the news some of our visitors sent me about his interview on Twin Cities radio station KDWB today. Longtime radio host Dave Ryan invited Spivey on the Dave Ryan Show this morning after he had an encounter with a listener on his way to Sturgis who requested he ask Spivey about Jodi’s case. While I disagree with a lot of what Spivey claims to ‘see’, I appreciate him talking about Jodi’s case and extend a special thanks to the Dave Ryan Show for discussing it on their program today. When he taps into a cold case he sees clear details. He’s claimed to have solved other cold cases in the past. He claims a Jodi had a stalker and he was the one who abducted her. Claims the suspect was questioned and released. Spivey says police weren’t equipped to handle the investigation. Man had beard, round face. Spivey can see him cleary. Man and Jodi were at a cookout-like outing, he’d call her and leave messages. Claims Jodi was taken to a ‘lake place’. She was visiting that place weeks or months before. Claims the suspect is alive and well and walking around like nothing has happened. Claims that if the investigation was re-opened and looked at, it could be patched together and figured out. Please let us know what you think of this interview. Leave a comment at the bottom of this page or take the discussion over to the forum. Thanks for stopping by. I am part of a private missing person forum and it is ironic that Spivey spoke about Jodi. We concentrate on finding the missing or remains. We agree with several of the comments stated above and will add additional details. We believe Jodi knew her abductor, he has a heavy mustache, hazel eyes, blondish colored hair, but not bleach blonde and resembles a gypsy. He has tattoo of a lady holding a rose on his right arm. He wasn’t married at the time, but had two kids. He is alive and well and moved to a warmer climate state. We are picking up New Mexico area. There was some jealousy as he coukd not have her and stalked her. Even though, he had other women on the side and may be involved in human trafficking. The question will Jodi ever be found? I think is 50-50, but will share what our group picked up. We feel her remains are outside of the Mason City limit area but still within the County. 6 to 7 miles east of the city. There is a hillside and a large tree trunk. Despite all of her bruises and broken bones, she manages to craw three or four feet from the tree trunk. There is well known visible trail near. We pick up “R” and think this Rorrick Park Trail. We see the numbers 162 and do not know if this house number, lot number or sat three of license plate number. There is a hayfield nearby and an old well hidden by tall grass. She may be in the well or not far from the large tree. There is a red barn shown or what was once a bright red barn nearby and no house on the abondoned property. He did not want her to go to the authorities, so after 2-3 days, he took her life. A couple in our group who search for the missing plan to go to Mason City before the end of the year! very similar to what I picked up, too. I’m hoping people can see my frustration. If you were our team and read everything posted by psychics within these pages, you’d see that nearly all of stories are different. Different location, different suspect, different circumstances. How are we supposed to value psychics as a legitimate way to find solid information on Jodi? It would take decades to follow up on each lead, vision and theory. I hope people can understand that while we appreciate some views and ideas by these psychics, the information isn’t always advantageous. I encourage people to seek out facts, make real connections and network with those who were in Mason City or knew Jodi or the group she hung out with. Piecing information through these sources is what will matter in the end. That is unless you’re the top 2-3% of psychics who have the magical solution. I agree with Josh on this. However I’m intrigued by the idea Jodi may be in something like an abandoned well. That might explain why she has never been found. I was hopeful that, during the recent drought when farm ponds and lakes were extremely low, someone would spot something that would arouse their curiosity, like a 50 gallon oil drum weighted with concrete. Recently, in Oklahoma, a car stolen in the 1990s was found in a pond just off a major expressway when its roof became visible above the waterline. There are lots of advantages to concealing Jodi in a well. It would have been quicker than digging a grave and much less vulnerable to animal intrusion or accidental discovery. Thanks for an interesting article, Josh. Tomahawk….Great Post…My thoughts Exactly from the beginning! I’d like to see one case, just one case, from anywhere in the world a psychic has actually solved. I also want police verification the case was solved by a psychic. Whoever did this knew Jodi’s daily routine (when she left for work, etc…). In an area that small, someone had to see her stalker in the days before the abduction because he either lived in the complex or visited the complex. I agree with the psychic that the culprit is known to police in one way or the other. Another sad part of this tragedy is that news studios make enough money to provide their early morning and late night female anchors with car service to and from the news studio. There are too many NUTCASES in this country and this young woman was clearly abducted by one of these NUTCASES. This case baffles every one who reads the details. This lady disappeared after talking to her boss. Was he in her apartment then? Did she let him in. Did he attack her on the way to her car? It is rather odd that three neighbors heard her screaming and did nothing, not even call 9-1-1. Mason County has Clear Lake State Park 9.43 mikes away and this is an ideal place for burying a body. 3,643 acres is like trying to find a diamond on a sandy beach. I believe she will be found one day. After reading articles and book Dead Air, I believe Jodi had a stalker in her midst. He may of even sent her something in the past or wrote about this in her journal or told a close friend. Just due to circumstances and her daily routine, he may of lived in close proximity of her apartment where she disappeared. Her Mother has failing health, but I feel should be entitled to view her daughter’s journal as well as close family members. She may of mentioned some one in her daily journal who made her feel uncomfortable. My area of experience was profiling suspects. This male wanted her, couldn’t have her and sees a psychiatrist for a mental illness. @294d89cf4d40142678bf0e0e6cf972d6:disqus, you can take this conversation to our Forum and have all the space you need. These spots are more or less just for comments related to the above story. But thank you for posting. We appreciate it. I always thought probably she was a victim of Robert Leroy Anderson. It was similar to the crimes he was charged with. Wondering if anyone can show he was elsewhere that day. I’m not a psychic. I don’t even think this will help anyone and I don’t even know why I have the need to post this at all, but here goes. I was reading comments from your previous posters and I don’t even know what brought me here, but – let me just explain this first, sorry if I’m all over the board, but I was looking at 911 videos and then I wanted to watch the television series Disappeared on Netflix. 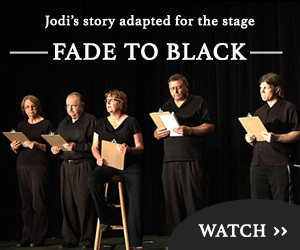 Found out it was no longer on Netflix and then started thinking about Jodi. I had seen her story on a TV show a long time ago, I think it was Unsolved Mysteries. She has never left my mind. Then I just put her name in the search bar and came to this website. So now, I was reading some of the comments here and one said she was near a tree trunk. I gasped so loud I scared myself. Some years ago I was in bed, very tired and I closed my eyes and I felt light or something, I don’t know how to describe it, but when I closed my eyes I saw this vision of a woman with blonde hair, on her face wearing just a tee shirt near a tree stump, not a tree trunk. I’m not saying it is Jodi. But for years I’ve wondered who she was or if she was anyone at all. From her back she looked like a teenager and that is what I thought for so long. I want to say her tee shirt was dark colored, forest green or something. Again I’m not a psychic. I’m just a person who had a strange vision. I have no idea where that is either. I don’t know the whole case but could she possibly have been murdered by a jealous female? Its just unfortunate that no one will listen, but willing to listen to crack pots like this psychis on this page. I have proof of one thing. That the person who did this was someone in the news broadcasting area of Cedar Rapids Iowa and Iowa City Iowa. I am unable to get this question answered by the KCRG TV news station of exactly how far their particular station radius broadcasts as this is someone who was planning this BEFORE she moved to mason city!. I can tell you something else too, this black man you have pictured as Tony is NOT the killer of her and does not know a damn thing about it because this man if you check the records was not living in the Cedar Rapids /Iowa City KCRG TV 9 BROADCASTING area in 1994-1995 time frame. But the one thing that is correct about the picture is the White Tee Shirt, the bald round head, except the guy who did this is a little bit older and does wear eye glasses and drives a utility van as part of his job and he is a WHITE MAN! These investigators have got to get off their asses and go to the IOWA CITY AND CEDAR RAPIDS AREA BROADCASTING and look for the person who did this! I can tell you this, I have several people who were sitting with me one night when I was watching the TV 9 news that aired at 5:00 with Jodi being the broadcaster. In a flash of a moment I seen a white man in a white tee shirt sitting in frtont of the tv getting angry I felt this as I watched the tv and could not compose myself when I said” Something is going to happen to JODI!” OH MY GOD”…I did try to contact tv9 news and Jodi, but it came with no response to forwarn her of her danger. It was when the tv9 news anchorman Bruce had made the statement “tonight we announce that Jodi Huisentruit will no longer be our TV9 Iowa city broadcaster, that she has accepted a postion at the station in Mason City. Again with witnesses in the room with me, again I got this eerie vision and scared and said out loud..”THIS WAS THE WORSE THING THAT BRUCE COULD ANNOUNCE” I was upset and in tears because I knew at that moment in Coralville Iowa on that day watching and listening to this, that the man was going to leave this area and go get her up there!.. I have contacted every police investigator from the get go and no one listens but when for no reason at all a person such as myself can look at a tv screen with no explanation what so ever, not even knowing or giving a damn about Jodi, and not understanding what I seen in my head and not knowing WHY and what makes this worse is the closed DOORS OF EVERYONE OF THESE INVESTIGATORS who were contacted immediately by me and continuously for the past twenty years to be taken as I take some of your comments as crackpots, but what is different from you and I is that I saw this going on before she moved there, I seen and felt this while she was on television , I had people around me who can validate what I am saying and what was said at the time. Do any of you? I know its difficult to work off of a vision and feeling, but I am telling you if they would look in the cedar rapids and Iowa City Iowa broadcasting area you will find the clues needed here. I know that there is either a disgruntled persons who is obsessed with her after meeting her or being befriended by her because she did not give him the time he wanted to have his story told or maybe an acquaintance that wanted more than just ffirendshit and she had to tell him no, it was a situation of her and a man where she felt uncomfortable about him and did not give him what he wanted that turned ugly. LOOK INTO THIS SOMEONE PLEASE!!!!!!!!!!!!!!!!!!!!!!!!!!!!!!!!!!!!!!!!!!!!!!!!!!!!!!!!!!!!!!!!!!!!!!!!!!!!!!!!!!!!!!!!!!!!!!!!!!!!!!!!!!!!!!!!!!!!!!!!!!!!!!!!!!!!!!!!!!!!! Your such a dumb idiot. When conventional is not successful, you try unconventional. During the time that Jodi worked in the Cedar Rapids /Iowa City Area was there ever a camera man that was fired that would go out and shoot stories with her? This person who did that was not a total stranger to her, it was someone who she had been around enough for this person to grow fond of her and then became very very angry with her. There has got to be some record at the KCRG TV9 news station in which shows her contacts for stories or stories she was working with and/or actual employee related firings close to her. These are the things you need to look at, please take me seriously I am limited on the investigation rights I have due to being a no one without credentials or authority. your staff has the ability to check the things I am asking of you. These things would have occurred with in the last six months she was in cedar rapids/iowa city broadcasting time frame. Was there any police report filed about anyone harassing and/or stalking her or employee records of a problem with another employee at the station being a camera man or someone who would work close to her on these stories then left. Or an employee working there who is a man period that either quit related to her or was fired or harassing her? There is no reason what so ever that this case should have been cold for over 20 years. There are reputable psychics out there he could have helped, and if you have contacted them, I still find it hard to believe that the case would still be cold. I bet the police of that town must feel like complete idiots, for not protecting her more, than what they did. This falls right back into their lap, shameful. Moreover, there are psychics who can ask Jodi’s soul what happen, and where is her body. Try that approach.